Any fitness journey and my journey in particular are dotted with people who have had a positive impact on me. While some serve as inspiration, others offer guidance and advice that helped me take my fitness to the next level. No matter their direct impact on me they are all strong role models when it comes to getting into shape and staying in shape. I trained at his club, Jun Ko Taekwondo for 14 years. Master Ko has been operating his club since 1982 and holds an 8th grandmaster degree from the World Taekwondo Federation. Believe me, his clap chin ups were a marvel to witness. Lorne is the General Manager and Personal Trainer at Advantage4Athletes, an organization that works with people of all fitness levels, from professional athletes and Olympic Medalists to adult league teams and newbies. I personally had the good fortune to attend several of Lorne’s boot camps and enjoyed watching the Lulu Lemon ambassador in action. While his professional career is in the world of speakers, as he is the President of Coincident Speaker Technology, it’s what Israel devotes his free time to that earned him both a spot on this list and my esteem. He has trained seriously for 44 years, generally going 7 days a week. If you go to LA Fitness in Vaughn, there is little doubt that you don’t know Israel. This one is a no brainer. Mark won a Gold Medal at the 1992 Olympic Games in Barcelona in the 110m Hurdles. On top of that, he competed at 4 Olympic Games, 5 World Championships and 2 Commonwealth Games and is a member of the Canadian Athletics Hall of Fame and the Ontario Athletics Hall Of Fame. Mark now dedicates himself to inspiring others as a Success Coach, Public Speaker and Mentor as well as being Director of Training and Development at One Health Clubs. Having operated his own private medical practice in Toronto for 39 years, Dr. Zoltan Rona is an authority in the world of health and nutrition. After an already distinguished career, Dr. Rona became the chief medical adviser for NAKA Herbs and Vitamins where he has formulated his own line of nutritional supplements under the brand name “TriStar Naturals” which are available nationwide in many health food stores. Personally, I am a patient of Dr. Rona and would describe myself as a disciple of his teaching. Gary “Big Daddy” Goodridge made his name as a heavyweight kick boxer and mixed martial artist who fought out of Barrie, Ontario. Before competing in kickboxing and MMA, Gary was one of the top ranked professional arm wrestling contenders in the world. Since the end of his fighting career, Gary has had to deal with Dementia Pugilistica– a form of Chronic Traumatic Encephalopathy that mainly affects boxers, wrestlers and other athletes who compete in sports where concussions are a common injury. Gary was nice enough to share his numerous past success and current challenges with me. With over 20 years of clinical experience, Dr. Levy prides himself on using Integrative and Functional Medicine Model, where he uses evidence based natural alternatives and treating causes of diseases before the disease manifests itself. That’s a mouthful, but this talented doctor has more designations than I can list. But his knowledge extends well beyond textbook knowledge. Alex Martin has been working as a personal trainer since 2004. He specializes in helping his clients with weight loss, cardiovascular health, muscular strength, metabolic conditioning, and using corrective/mobility exercises for improving structural integrity. I personally met Alex a few years back at an A4A Boot Camp and watched a guy in great shape get in even better shape. Monte represented Canada on the world stage as a competitor in the 400 meter hurdles at World Championships and Commonwealth Games. Monte is another member of the A4A team that met almost 20 years ago at Extreme Fitness, when I saw him hurdle a bench press. Alex is a strength coach and consultant at Body + Soul Fitness. While I was dealing with shoulder pain – I came across one of Alex’s articles he definitely knows his stuff. I just started training with Alex and have found it highly beneficial. Also known as The Black Prince and Mr. Lifestyle, Robby is a former professional bodybuilder that has been able to keep himself in tremendous shape, even into his 70’s. Some of his more impressive bodybuilding victories were in Mr. America, Mr. World, Mr. Universe and Masters Olympia. He also appeared in the incredibly popular documentary Pumping Iron. Having the opportunity to interview Robby Robinson was a thrill. The man is a flat out icon. If you’re of a certain age, you grew up seeing Hal Johnson and his wife Joanne McLeod on your TV screen encouraging you to get out, be active and of course to Keep Fit and Have Fun. They are hard at work creating more episodes of BodyBreak and appeared on the first season of the incredibly popular Amazing Race Canada. He is a true Canadian Icon. Igor is an incredibly accomplished personal trainer who is even being ranked as one of the top 5 personal trainers in Toronto. Igor had two books published and is a sought after fitness educator. It has been a real treat to have him as a regular Fit After 45 contributor. Kathleen is an author, a personal trainer, a Pilate’s instructor who has contributed to the Globe and Mail and the Huffington Post. Kathleen has contributed her expertise to Fit After 45 many times and right now, Kathleen is also helping me design a Fitness Program for our upcoming 60 Day Fitness Challenge. Stay Tuned. Scott is a weekend warrior in the truest sense of the word. During the week, he is a devoted husband and father to two teenage boys, and a golden retriever, while he slings insurance for Equitable Life. When the weekend comes, Scott is all about his training. He likes to pick a big event every year that he says “excites and scares him”. Those events have included Ironman Canada and the famed Boston Marathon. Bernie Nicholls tallied 1209 NHL points skating for the Kings, Rangers, Oilers, Devils, Blackhawks and Sharks. He is a name that jumps off the page for anyone who grew up watching hockey in the late eighties and early nineties. It was a pleasure talking with Bernie about his career and his current venture All Sports Market. Bernie was a big get for Fit After 45 in our early days. We first featured Mary in an article last year focusing on Olympic Athletes who competed over the age of 40. At that time, Mary was preparing to compete in the 2016 Rio Olympics, which was to be her 5th Olympic Games as a member of the Australian National Dressage Team. During those Olympics she was 61 years old, and despite some, who dismiss equine sports as not requiring much athleticism, I can tell you that to not only staying on but controlling a horse with nothing but your own physical prowess takes so much muscle control it would leave most gym rats hurting. To do that at a world class level into your sixties is incredibly impressive. Tonya was a mainstay in women’s freestyle wrestling for Canada on the international stage, capturing a Bronze in the 2008 Olympics in Beijing and Silver in 2004 and 2012 in Athens and London respectively. When I spoke with Tanya,it was the way she spoke about needing to change her mental approach that really stood out to me. If you don’t immediately recognize the name Daniel Igali, you would definitely recognize the image of him at the 2000 Sydney Olympics with a Canadian flag wrapped around his shoulders and a gold medal around his neck. As one of Canada’s most celebrated Olympians, it meant a lot that he was willing to share his thoughts and insights into athletics. Alicia Webb is someone that a lot of people might recognize when see her, but not recognize her name. That’s because at the high point for Professional Wrestling in the late nineties and early two thousands, she was appearing in the WWE under the name Ryan Shamrock, the fictitious sister of former UFC fighter Ken Shamrock, who had crossed over to pro wrestling. Speaking to anyone who’s gone through the ups and downs and grueling athletic culture of pro wrestling will give you some real insight into an often ignored side of pro sports. A pro basketball player turned fitness guru, Shane approaches training someone with the hopes of inspiring and empowering them so that they can become happier, stronger and more optimal through training that focuses on agility, coordination conditioning, balance and power. When you consider the toll playing basketball at a high level can have on your body, its remarkable Shane can still do the stuff he does. Michal is tennis pro and has been playing and teaching the game she loves since she was 13 and now boasts over 30 years of coaching experience. Perhaps her most impressive prodigy was Milos Raonic, whom she coached when he was a child. Personally, I’ve known Michal for over 30 years. We went to Junior High at Zion Heights and I still get tired just looking at her workout schedule but it is obviously working for her. JP started Body Essence Training with a small studio in Toronto, all the way back in 1996. JP’s approach has always been to focus on each individual client and achieving their personal goals. His company The Catanzaro Group also deals with nutrition, supplements, lifestyle, seminars, and publishing. I personally met and trained with JP for about 2 years and I can tell you he’s a great guy who really knows his stuff. Ken Kinakin is a sport medicine doctor, chiropractor, certified strength and conditioning specialist and personal trainer! He’s also the author of the book “Optimal Muscle Training” and on top of that he was a competitive bodybuilder and powerlifter for more than two decades. Dr. Kinakin treated me a few times about 15 years ago. He is a very knowledgeable and talented guy. Another Member of the A4A team, Emmanuel Ofori, is a top notch trainer, and anyone who gets the A4A stamp of approval is held in very high regard in my books. 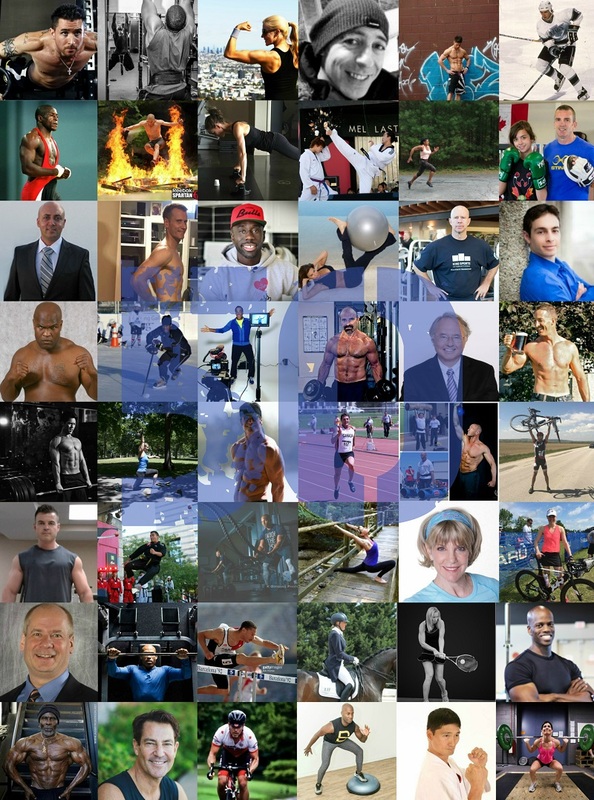 Haley has trained a ton of professional athletes, including members of the Toronto Blue Jays. Her approach is designed to improve core strength and improve flexibility to try and help stave off injuries over a grueling season of games and training. Haley’s approach to balance and core stability is one that I echo whole heartedly. Along with being a multi time contributor to FitAfter45, Josh Hewett is also an incredibly accomplished personal trainer, coach and the author of Get Lean, Get Strong and Get Mental. Josh is also the founder of Team Barbarian Strength Athletics. Josh’s training methods focus strongly on providing knowledge on how to train and how to use nutrition to achieve your fitness goals. Another regular contributor to FitAfter45 , Davida is a trainer who has always applied a different approach to physical fitness; taking physics-based training methods, examining how to affect muscles using different angles with minimal risk of injury. This style of training led her into her current specialty of using Muscle Activation Technique. Davida’s approach includes, “Investing in another pair of eyes to examine how you move” which I couldn’t agree with more. Katherine founded both Yoga For Baseball and Yoga For Golfers. After spending 13 years as a trainer in the MLB for Oakland A’s, LA Dodgers, San Diego Padres, Chicago Cubs, Cincinnati Reds, Texas Rangers and the Milwaukee Brewers as well is with a ton of PGA and LPGA golfers. Her approach, applying the movements and balance of yoga to other sports is ingenious. James is the operator of Body For Wife http://www.bodyforwife.com/ and a certified strength and condition coach as well as an internationally syndicated fitness columnist for the Chicago Tribune, and the lead fitness writer for AskMen.com. His work has also appeared in Chatelaine.com, Men’s Health, TIME Magazine, the Guardian and NPR. Jamie is also the author of Lose It Right: A Brutally Honest 3-Stage Program to Help You Get Fit and Lose Weight Without Losing Your Mind. I personally love his mantra of finding something you love and get good at it and do it until the day you die or at least as close to the day as possible. Keli is likely the most recognizable person on this list, that is if you ever bought a work out VHS. She was known as the trainer to the stars, having trained Cher, Kirstie Alley and Russell Crow to name a few, and had a super successful Step video that featured Cher. Keli shares some incredible insights. I really like what she has to say about how exercise impacts mood and that exercise is medicine. An incredibly accomplished trainer fitness DVD superstar, Rob Glick is perhaps the foremost expert in the world of BOSU. He not only advocates for its use, but will happily extol it’s virtues to anyone. I ordered one of Rob’s DVDs 20 years ago and it is still a true fitness gem. Jay has been working as a trainer in the fitness industry for more than 12 years and is the owner of Arzadon Fitness. His fitness journey started as a boy lifting encyclopedias, because he didn’t have weights and that resourcefulness is still a big part of who he is a personal trainer. Jay hits the nail on head because he stresses the importance of a following a program. This will keep you on track and allow you to monitor your progress. The owner of Motor City Boxing Club, Don is one of the most respected boxing coaches in Canada over the last 25 years in the business. He also fought in 81 amateur fights and was a Lightweight Champion. I completely agree with Don’s approach which is about the importance of self confidence in sport and the ability to stay relaxed and have fun. Kareem definitely puts the “personal” in personal training by focusing his efforts on helping anyone and everyone desiring to change their lives by finding their FITT and is continually building on his knowledge base to help his clients get on the road to healthy lifestyle. Kareem and I see eye to eye on many things including his belief in training with purpose and focus. Andrew is amazing with providing people with detailed nutritional plans that are completely specific and he outfits more than one hundred gyms across North America with custom made nutrition. When speaking with Andrew, he touched on the need for older athletes to train smarter, not harder which resonated with me. I first met Derrell about five years ago at Advantage4Athletes. I could quickly tell that he was a high-level athlete and a great person to learn from. It looks like the apple didn’t fall far from the tree – Derrell’s Dad had great advice, “When you are sleeping, someone else is always working”. Derrell is the founder of In-Tech Skills and Conditioning, committed to the advancement of performance training and injury prevention. Jessica Spieker is a trainer and owner of Full Swing Fitness, who offers fun and effective in-home personal training and teaches kettlebell and barbell classes at the Cooper Koo and Central YMCA. Jess and I share some very similar beliefs and specifically that post 45 athletes should be focusing on stability and strength training for your shoulders and knees. David is the Owner and Head Master at Master Seo’s Dynamic Taekwondo. He is Kukkiwon Official 6 Dan Black Belt Canada National Taekwondo Champion. David brings his energetic style to his school and his students which have included both me and my son when we trained with him at Jung Ko. Matt is another athlete I met while training at Jun Ko TKD. I definitely respect Matt as an athlete, and after going toe to toe with him in multiple sparring sessions I can attest that he has the hardest shins in the business. Deidre came to my attention thanks to an insane jump rope video featuring the super fit mom in her 50’s putting on an incredible display. Deirdre had been a competitive runner, who lost her fitness way only to get it back later in life. A truly inspirational story. Jorge runs a successful insurance brokerage and he specializes in helping out entrepreneurs and those who work in the sports industry. I have had the good fortune of getting to know Jorge on a business level over the last 5 years. He is extremely bright and engaging guy who has added fitness to his list of passions and added it in a big way. Johnny is a truly remarkable athlete who has devoted a lifetime to building and sculpting his body. Johnny was diagnosed with cancer and trained all the way up to within two days of his surgery and was back at six weeks after. I’ve always thought that Johnny exemplified a passion for fitness. Jordan and I met when we played on the same Fast-pitch team. His drive and athleticism where immediately obvious, however, I only recently found out about the obstacles he’s overcome to achieve his current level of athletic excellence. Dave is one of the city’s top real estate agents and has appeared all over your TV in the past few years. I have known Dave close to 20 years we have been clanking Barbells and Dumbbells together at Bally’s, Extreme Fitness, A4A and LA Fitness.